This article is about the game for the Nintendo 3DS. For information about the level from Super Mario Maker of the same name, see Nintendo Badge Arcade (level). Not to be confused with Nintendo Arcade. Nintendo Badge Arcade is a free-to-start application available from the Nintendo eShop for the Nintendo 3DS. 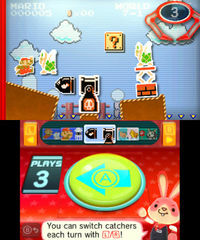 The game involves collecting badges in various Nintendo-themed crane-game minigames, which can be used to customize the 3DS HOME Menu. It was first released in December 2014 in Japan, and later in November of 2015 in Western regions. Though players can earn badges without paying any real money, money can be used to earn more plays and therefore more badges. Players can also obtain exclusive 3DS HOME Menu themes with this application, when available at certain times in the arcade, by buying at least ten plays. The application requires an internet connection and an SD card to play: all badges are stored in the SD card where the game is also stored in. The badge sets and other features in the arcade rotate, with changes being made after 2:00 AM PST on Nintendo's server passes. As of June 22, 2017, Nintendo Badge Arcade has over 8,800 badges overall (over 9,999 badges in the Japanese version). Due to internal memory constraints, no more badges will be added as they will now rotate old badges everyday and give the player two free plays per day each time the game launches. An example of a catcher. This one is themed after Super Mario Bros.. The game takes place in a digital arcade hosted by a pink rabbit called the Arcade Bunny, a shop assistant who provides information and news to the player. The main hall is the menu of the game, where the player can select one of the various modes. From the main hall, the player can press to access one of the modes, press to place badges, press to view their collection, and use and , the , or the to navigate modes. To earn credits to play on the badge-catcher crane machines, the player can pay real money, earn free plays, or enter play codes. Five credits cost ¥90 in Japan, $1.00 in the United States, £0.90 in the United Kingdom, and $1.30 in Australia and Canada. The player must have the funds in their Nintendo eShop account in order to purchase plays with real money; a Nintendo eShop Card or credit card is needed to add funds to the account. The player can earn free credits by playing the Practice Catcher once a day, or by receiving them as a gift on special occasions; first-time players receive five free plays. To use play codes, the player must tap the bunny on the touch-screen in Badge Catchers mode and select "I have a play code!". A play code can be used only once. At certain times, the bunny offers the player the option of increasing the number of plays to purchase at one time. The player can return to the original payment structure by tapping the bunny on the touch-screen in Badge Catchers mode and adjusting the Bundle setting. The player can use badges to decorate the HOME Menu on their 3DS by placing them in open slots next to the software icons or by attaching them to folders; some badges also serve as software icons. Players can decorate with badges by accessing the badge box. Outside of the game, the badge box can be accessed through the HOME Menu Design settings. In the game, the Place Badges option in the main hall directly navigates to here. To attach badges to folders, the player must first have created a folder on the HOME menu. They can then be attached from the badge box settings as long as they are not already being used. The player can also use themes to customize the look of the HOME Menu; themes change the Menu's background and look of the folders. Players' progress is saved automatically at specific times, such as whenever a play is completed on a badge catcher. During a play, if the system is turned off, loses power, or loses the Internet connection, the player can lose progress made since the last save as well as any remaining plays. Progress cannot be restored, and lost plays cannot be refunded. The default crane used in Badge Catchers. The Badge Catchers mode has a variety of catchers based on Nintendo franchises, such as Super Mario and Animal Crossing. The machines and badges available change with real-time updates. To control the crane, the player must press and hold or the yellow button on the touch-screen to move it left. Releasing the button will drop the crane and, if successful, collect any badges within its range. There are different kinds of crane-machines, as well, including a hammer, a bomb and a stick. After the player has used one of the catchers, they can swap to a different one for the next turn by pressing or between plays. The player can press to return to the main hall; once a number of plays has been started, the player must use them all before returning. The contents of the badge catcher can also be reset by tapping the bunny and asking him to reset them. When a badge catcher's contents are reset, all badges still in the machine will be returned to their original positions and new copies of any badges the player has caught will be used to restock the machine; resetting does not affect the players collection of caught badges. The practice catcher with wooden badges. The Practice Catcher mode is a daily practice-version of a badge-catcher. Once a day, the player is given five plays on a featured, practice catcher to play on for free. In this mode, the badges are replaced with "dummy badges" made of wood, and there is sometimes a "bonus" badge in the catcher. The bonus badge can have a red or blue target printed on the hidden side, making it a game of chance. When the player gets the super bonus, they earn three free play-credits for the red targets and one for the blue. The player can also earn free plays by catching practice badges; earning one free play for every ten practice badges. Additionally, clearing the practice machine of badges with plays still remaining will refill its original content. The Collection mode is where the player can see all of the badges they've collected so far. The player can view the number of badges owned, sets started, sets completed, and which category a set belongs to. As the player gets more badges, they will level-up and there will be upgrades made to the main hall; the upgrades being changes made to the statue for the collection. The first level-up, the "entrance level-up," occurs when the player acquires 20 badges. The second level-up occurs when the player acquires 50 badges. Additional level-ups occur after every 50 badges; Level 3 (100) replaces the wooden statue in the lobby with a stone version, Level 4 (150) adds badges to the statue, Level 5 (200) replaces the statue with one of blue-tinted bronze, and so on. The Miiverse Gallery mode has posts that players have made to Miiverse to show their customized Home Menus. It is a curated space, so posts are chosen and recommended by Nintendo. The Theme Shop is a section of the arcade that can be accessed if the player has completed the objectives for a "special offer". The special offers are timed events where the player will need to buy a certain number of plays during a period of time in order to receive the bonus theme being promoted. The Help Desk is a section of the arcade where the player can change the categories in their badge box, sign-up for the newsletter, or set-up info sharing. The player can also find out about badge problems, transferring data, and access the digital, instruction manual. In addition to the game-specific sets, the characters Ashley and Red appears in multiple sets, where they're drawn with themed outfits. The duo have their own panel in the New Year, Christmas, Valentine's Day, Halloween, Band Brothers and Splatoon sets. An Ashley badge also appears in one panel of the Nikki and Friends set, and Ashley appears on special Nintendo Badge Arcade-branded point cards released in Japan. The Mario & Friends set contains Mario-themed character emblems and software icons. Additionally, the Pixel Collection set, while not exclusively Mario, contains retro cartridges of games from the Mario series. 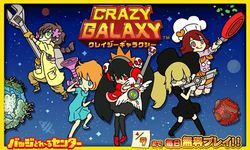 Key art for Crazy Galaxy. The Japanese edition of the game featured an April Fool's gag, where on April 1, 2017, the Arcade Bunny announced that a "Badge Arcade Direct" would take place, presenting concept art for a new game titled Crazy Galaxy. Crazy Galaxy starred an adult version of Ashley and four new characters named Claudia, Coco, Vanessa and Anna, who, after an accident in "astronaut school", are flung to the other end of the universe and must fight or befriend various aliens to get back home. The "direct" ended with the Arcade Bunny admitting such a game would not come out "before the 2020 Tokyo Olympics", but inviting players to discuss the idea on social medias and Miiverse. The application has received mixed to negative reviews with various professional video game critics. Justin Berube of NintendoWorldReport gave the game a 6 out of 10, noting the positives of the frequent updates and the dialogue of the Arcade Bunny, but criticizing the price and the methods the game uses to psychologically give players a need to spend their money. He complained that the game "is the most disgustingly blatant, money grabbing game Nintendo has ever released." Lee Garbutt from God is a Geek has stated that the game can be fun as long as players either abstain from paying or that they set themselves a budget, though he does note that the game is pushy to make players spend money. He gave the game a 5.0 out of 10. The most negative reviews from the game come from Cubed3 and The Jimquistion, with both writers giving the game a 2 out of 10 André Eriksson of Cubed3 has complained about the price of the game and the rewards that are lackluster. He has stated that it is the "bare minimum" to what can be sold as a game and that "It is a watered down digital crane game at the price of a full-sized one with physical prizes." Jim Sterling of The Jimquistion negatively written the game as "a virtual UFO catcher in which you pay money for almost literally nothing." and described the Arcade Bunny with the following: "It’s creepy, is what it is. This lagomorphic huckster, constantly attempting to convince you that you’re having so much fun while doing its best to encourage further expenditure – all while transparently doing its level best to not look like it’s encouraging everything. I despise this rabbit. This cottontailed conman, the family-friendly face of capitalism unchained." Sterling has also compared the game to Final Fantasy: All The Bravest in terms of its free to play concept and gameplay. On the flipside, while the writers of Destructoid have not written an official review, Chris Carter has written that the game is "a brilliant concept". Carter praised how it is yet another title that 3DS owners can enjoy in a daily basis, and the badges it offers grants users the ability to customize their 3DS backgrounds, though he also notes that the game notoriously attempts to sell players its items as well. Nintendo 3DS André Eriksson, Cubed3 2/10 "Nintendo Badge Arcade is the bare minimum of what could be sold as a game. It is a watered down digital crane game at the price of a full-sized one with physical prizes." Nintendo 3DS Jim Sterling, The Jimquisition 2/10 "Cynicism in the form of a creepy pink rabbit." Nintendo 3DS Lee Garbutt, God is a Geek 5/10 "It’s a rather transparent and honest take on free-to-play monitisation, and as long as you’re sensible enough to either abstain from paying any money, or to set yourself a budget, then there’s a little bit of fun here for you." Nintendo 3DS Justin Berube, NintendoWorldReport 6/10 "If you have a gambling problem, you should probably stay away from this game." 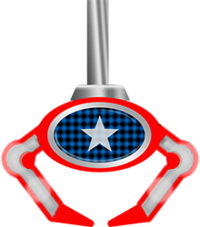 WarioWare Gold: Most of the Ashley badges (excluding the crossovers with other videogame series and the Crazy Galaxy set) are unlockable in the Pumpkin Panic minigame. Super Smash Bros. Ultimate: The Arcade Bunny appears as an Assist Trophy. For this subject's image gallery, see Gallery:Nintendo Badge Arcade. ↑ Berube, Justin. (December 28, 2015). Nintendo Badge Arcade (3DS) Review. NintendoWorldReport. Retrieved January 13, 2016. ↑ Garbutt, Lee. (November 13, 2015). Nintendo Badge Arcade Review God is a Geek. Retrieved January 13, 2016. ↑ Eriksson, André. (December 13, 2015) Nintendo Badge Arcade (3DS eShop) Review Cubed3. Retrieved January 13, 2016. ↑ Sterling, Jim. (November 13, 2015) Nintendo Badge Arcade Review – Badge Of Dishonor The Jimquistion. Retrieved January 13, 2016. ↑ Carter, Chris. (November 12, 2015). "Nintendo Badge Arcade is a brilliant concept". Destructoid. Retrieved January 13, 2016. This page was last edited on April 14, 2019, at 16:39.